I’ve bought my first tablet! 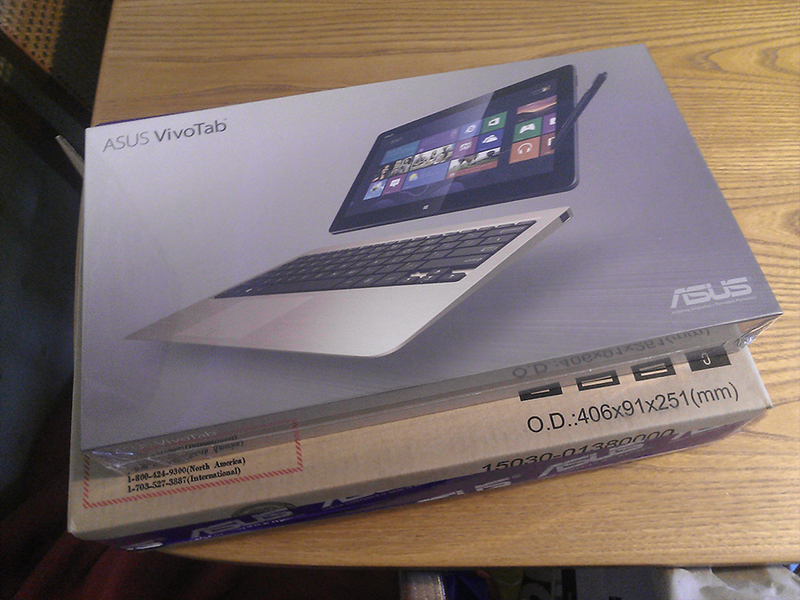 Last Saturday I ordered the Asus Vivo Tab TF810C from Amazon.co.uk and it arrived on Monday. 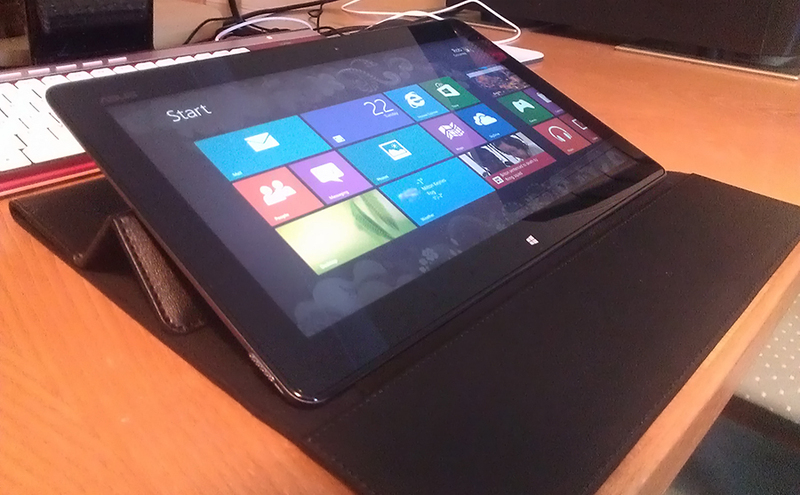 I’ve been really excited about this specific tablet after some research into Windows 8 tablets last year. It was a difficult decision between this and the Microsoft Surface Pro. I chose the Vivo Tab because it it has a far longer battery life (Asus say up to 19 hours with the keyboard dock, we’ll see about that), and a bigger screen. While pricing hasn’t been announced in the UK for the Surface Pro yet, I’m pretty sure the Vivo Tab is also cheaper. There are no fans in the Vivo Tab too, and when it sits in the keyboard dock it can fold like a laptop and the screen can be at any angle, the Surface has only one position using the kickstand. The tablet comes with the keyboard dock which has 2 USB ports and an additional battery. It also comes with a Wacom Digitiser pen and a nice case which doubles as a stand, which I really like. Unfortunately the case only holds the tablet on its own, not connected to the keyboard dock, I’ll have to get a proper bag for it. 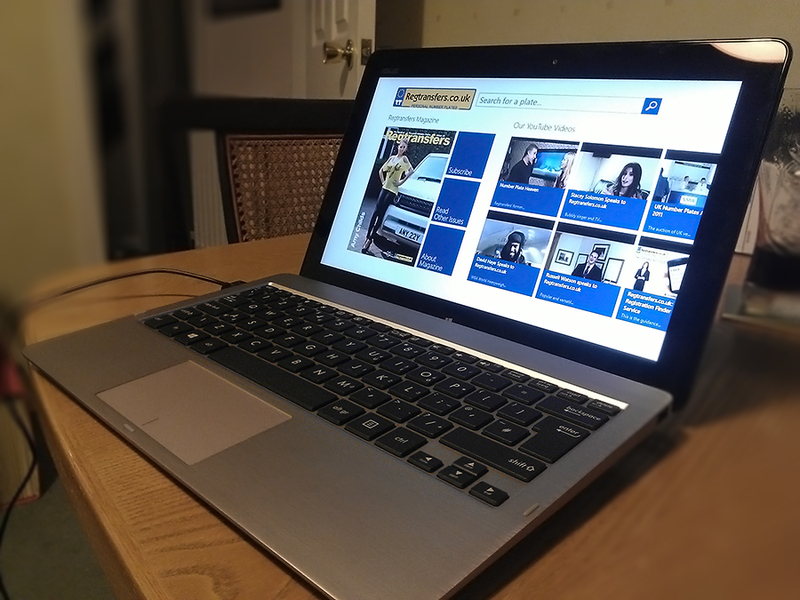 I have really enjoyed the Tab so far, the screen is great and Windows 8 runs well on it. The Intel Atom processor isn’t very powerful so the desktop is a bit slow, however the formally ‘Metro’ environment is very slick and runs great. We just need a bigger, better selection of apps in the Store now. Danny Brown’s Regtransfers app running on the Vivo Tab. A great feature of Visual Studio is the remote debugger. It allows you to deploy your apps to another device over Wi-Fi, in debug mode, and use the app running on that hardware, but also pause the app in Visual Studio on your development machine to debug like you would normally. I’ve been able to run Kuler Touch and get a good look at how that runs using a touch screen. Speaking of Kuler Touch, I’ve made great progress and the app now loads comments, caches themes and stores your favourites locally. Still a while to go before it’s Store-ready I think. Anyway, I’m looking forward to seeing what this tablet is like to work on when I get back to university, should be good. is like to work on when I get back to university, should be good.